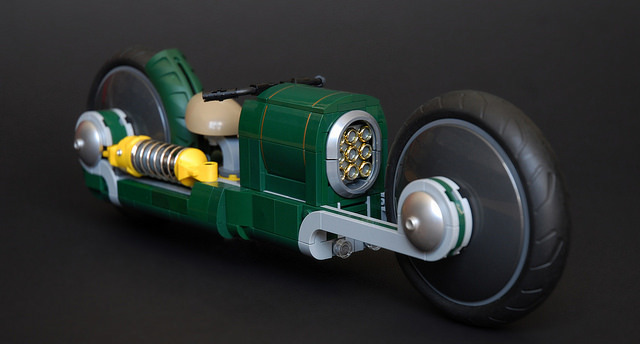 French builder Vince Toulouse has invented a Victorian era motorcycle using dark green elements from the legendary 10194 Emerald Night train set. But there is no better way to personalize a model than with a couple of bold touches. This time these are a pair of the biggest Technic shock absorbers, which still cannot drag all the attention from a masterfully devised and executed grill on the front of the bike’s body, made with a dozen golden 1×1 rings.